It aims at providing more detailed information concerning the state of implementation of each macro-regional strategy. The document is based inter alia on contributions from the key stakeholders of the strategies, EU institutions, Member States representatives, academia and experts. The differing structure between the individual chapters on each of the four macro-regional strategy is due to the different maturity of each strategy (they have been adopted at different time) hence the differing availability of data and deliverables. The size and diversity of the European territory warrants a differentiated, yet strategic approach to its development. A globalised economy, rapid technological change, increasing interdependence between countries, growing role of sub-national authorities, as well as borderless, territorially-relevant challenges such as climate change, ecological degradation and migratory inflows, call for cooperative frameworks whereby groups of countries belonging to a wider geographical space can cooperate to address common challenges and opportunities. MRS are accompanied by a rolling action plan to be regularly updated in light of new, emerging needs and changing contexts. The four MRS concern 19 EU Member States and 8 non-EU countries. Some EU countries such as Germany and Slovenia are involved in 3 MRS, and some EU countries such as Croatia, Italy and Austria in 2. The regulatory framework for the European Structural and Investment (ESI) Funds for 2014-2020 places MRS into the legal framework of the EU and provides a comprehensive definition of it. According to the Common Provisions Regulation 2014-2020 1 , a ‘macro-regional strategy’ is an integrated framework endorsed by the European Council, which may be supported by the ESI Funds among others, to address common challenges faced by a defined geographical area relating to Member States and third countries located in the same geographical area which thereby benefit from strengthened cooperation contributing to achievement of economic, social and territorial cohesion. MRS are an important innovation in territorial cooperation and cohesion. However, they are differing in several respects from cross-border and transnational territorial cooperation. One key feature of macro-regional cooperation is its anchoring to integrated, strategic, longer-term-oriented and open-ended frameworks. In addition, MRS are requested by the participating countries and reflect their strong political commitment towards joint achievement of common objectives. MRS aim at addressing challenges and opportunities specific to a certain geographical area and define a set of shared, long-term objectives agreed by the participating countries. The objectives vary according to the needs of the macro-region concerned. Prominence is to be given to strategic issues bringing an added value to horizontal EU policies. The European Union Strategy for the Baltic Sea Region (EUSBSR) is the first macro-regional strategy in the history of the European Union (EU). Its origins date back to 2006 when the European Parliament in its resolution on a Baltic Sea Region Strategy for the Northern Dimension 2 urged the European Commission to come up with a proposal for an EU Baltic Sea Strategy. In December 2007, the European Council in its Presidency Conclusions 3 invited the European Commission to present a long term strategy for the Baltic Sea region no later than June 2009. Following this request, the European Commission presented a Communication on the EUSBSR on 10 June 2009 4 alongside a detailed Action Plan. The European Council endorsed this approach in October 2009 5 . The EUSBSR unites eight EU Member States (Estonia, Denmark, Finland, Germany (Berlin; Brandenburg; Hamburg; Mecklenburg-Vorpommern; Schleswig-Holstein), Latvia, Lithuania, Poland and Sweden) representing 80 million inhabitants or nearly 16% of the EU population. The Strategy is welcoming cooperation with non-EU countries from the region, namely Belarus, Iceland, Norway and Russia, in actions and projects of common interest 6 . A first progress report on the implementation of the EUSBSR was issued in June 2011 7 . The first report on the implementation of the four macro-regional strategies, thus including the EUSBSR, was issued in December 2016 8 . The implementation of the EUSBSR has been progressing over the last years and various results, varying from one thematic area to another, have been achieved. These are summarised below. Further efforts to strengthen ownership of countries involved have been taken up with the adoption, in June 2017, of the rules of procedure for the Group of National Coordinators of the EUSBSR. Among others, they outline the composition of the group, its rules, responsibilities, tasks and a decision-making procedure. The rules of procedure also establish the order of rotating chairmanship of National Coordinators Group and organisation of the EUSBSR annual forum until 2025. This brings more stability to the governance structure and allows focusing better on more concrete implementation matters. Moreover, it was agreed that the non-attributable reports of the group are to be published on the EUSBSR website making the governance process more transparent. Contrary to other EU macro-regional strategies (e.g. in the Danube and the Adriatic and Ionian regions), so far no dedicated ministerial meetings have been held back-to-back to the EUSBSR annual fora. An important step forward towards this has been made at the annual forum of the EUSBSR in Tallinn (June 2018) where a possibility to organise regular meetings of ministers responsible for regional development of the eight countries back-to-back to the annual forum, was raised 9 . These ministerial meetings could adopt conclusions or declarations that should help implementation e.g. by giving a mandate to the strategy’s key implementers. Nevertheless, this suggestion requires further reflections on its practical application. Since the last reporting in 2016, the EUSBSR Action Plan has been revised with an updated version published in March 2017. Apart from a number of technical updates and corrections, main changes on substance concern a revised chapter of policy area ‘Transport’, the inclusion of a new action on the integration of refugees in policy area ‘Education’, and Lithuania's appointment as a co-coordinator of policy area ‘Energy’. Moreover, in the governance chapter a new section on the procedure to follow in case of change of thematic coordinators was added. A more extensive revision of the EUSBSR Action Plan is to be launched at the end of 2018. The main aim of the revision is to make the Action Plan more up to date with a view to reflecting new emerged needs and priorities as well as to make it more streamlined and better focused on priorities that are of strategic relevance and bring clear added value from a macro-regional perspective. Implementation of actions under the EUSBSR continued to support and further foster implementation of relevant EU legislation and strategies, in particular in the field of environment. While the European Commission adopted the first-ever Europe-wide strategy on plastics in January 2018, an important work in fighting against plastic marine litter has already being carried out in the framework of the EUSBSR. The work carried out in the framework of the EUSBSR has been recognised in the HELCOM Ministerial Declaration of March 2018, namely the establishment, under policy area ‘Hazards’, of a regional cooperation platform (Baltic Sea Pharma) to reduce pharmaceuticals in the Baltic Sea. The declaration acknowledged that projects of common interest under the EUSBSR had given substantial contribution to the implementation of the HELCOM Baltic Sea Action Plan (BSAP) 10 . Furthermore, in the same declaration the countries committed to continue the constructive cooperation with actors involved in the EUSBSR framework to contribute to the implementation of the BSAP and to endeavour to ensure synergies between the priorities of the BSAP and, among other frameworks, the EUSBSR Action Plan. The project BLASTIC 11 aims at reducing plastic waste and, thereby, the inflow of hazardous substances into the Baltic Sea by mapping and monitoring the amounts of litter in the aquatic environment. As a result, the project compiles a list of sources and pathways, as well as recommendations for resource efficiency in the waste and water sector. Eco-efficiency of the Baltic Sea region's maritime industry has been increased by projects such as ECOPRODIGI 12 that aims at reducing the ecological footprint of transport vessels during their lifecycles trough digitalisation. ECOPRODIGI supports Baltic Sea region in becoming a front-runner in maritime industry digitalisation and clean shipping. EnviSum 13 Environmental Impacts of Low Emission Shipping: Measurements and Modelling Strategies. The project results will provide policy makers and authorities with tools and recommendations for the development of future environmental regulations, and the shipping sector with guidance to support future investment decisions. The platform Baltic Sea Pharma 14 is an ongoing EUSBSR flagship project. The main objective of the platform is to foster, via regional cooperation, the implementation of physical measures within a reasonable timeframe, e.g. by 2020, resulting in reduced emissions of pharmaceuticals to the Baltic environment. A challenge of ageing society in the Baltic Sea region has been addressed through projects like BaltSe@nioR 15 . The project develops innovative solutions to support enterprises in the Baltic Sea Region in product development aimed at raising comfort and safety of seniors' home living. BSR Stars 16 is a flagship within the EU Strategy for the Baltic Sea Region. It aims at strengthening competitiveness and economic growth by linking strong research environments, clusters and SME networks – creating innovation partnerships that address common challenges in the Baltic Sea Region. In addition, it also aims at strengthening innovation policy capabilities to work with smart specialisation on a macro-regional level. BalticRIM 17 will bring together actors in charge of maritime cultural heritage (MCH) and spatial planning from seven countries, including the Russian Federation, around the Baltic Sea to jointly develop commonly agreed spatial planning perspectives for MCH. Through the transnational exchange of experience and knowhow and the joint development of these perspectives, these actors will gain new knowledge on ways to steer the integration of MCH into cross-sectoral planning processes. Furthermore, they will learn how to foster sustainable Blue Growth through the use of synergies between MCH and other activities by intelligent management and spatial planning. Baltic Science Network 18 (BSN). Its aim is to provide science and research ministries of the Baltic Sea region states with an overall coordination framework to develop and implement science policy in a macro-regional dimension and to ensure a better representation of macro-regional interests on the EU level. The BSN project also aims to develop and implement transnational strategies, incentives and programmes to support higher education, research and innovation and to develop R&I excellence. School to Work 19 (S2W) aims to strengthen transnational cooperation between stakeholders in the Baltic Sea Region in the field of education and work in order to prevent early school leaving and develop support for vulnerable groups of students/youth, specifically NEETs, early school leavers and newly arrived refugees. EMMA 20 is a Flagship of the EU Strategy for the Baltic Sea Region aiming to enhance freight mobility and logistics by strengthening inland waterway and river-sea transport and by promoting new international shipping services. The container barge pilots in Poland and Sweden are noticeable examples of its outcomes so far. TENTacle 21 - Capitalise on the core network corridors implementation for the prosperity, sustainable growth and territorial cohesion in the BSR. The TEN-T core network corridors (CNC) is an instrument of the EU transport policy, aimed to improve mobility, intermodality and interoperability on the major transport axes across Europe. The Baltic Sea Region (BSR) is intersected by three core network corridors: Scan-Med, North Sea-Baltic and Baltic-Adriatic. A broad range of stakeholders are expected to be involved in a joint action to remove physical, technical, operational and administrative bottlenecks along these corridors by the year 2030. Baltic InteGrid 22 is aiming to contribute to sustainable local electricity generation, further integration of the regional electricity market and enhancing security of supply around the Baltic Sea. The Baltic InteGrid will provide a professional network for expertise exchange and a state-of-the-art interdisciplinary research on the optimization potential of offshore wind energy in the Baltic Sea region by applying the meshed grid approach. The project is a step towards the creation of a fully interconnected and integrated regional energy marked, the implementation of the Baltic Energy Market Interconnection Plan and the demonstration of coordinated offshore wind connection solutions. ‘Let’s communicate! 24 ’ project aims to maintain and further develop the communications of the EU Strategy for the Baltic Sea Region. The project gathers current information about EUSBSR developments to its communication channels, promotes the use of the EUSBSR visual identity and provides with communication support and tools to the EUSBSR stakeholders. In addition, the project will reach out to new target groups in order to attract new stakeholders to take part in action. According to Eurobarometer on ‘Citizens' awareness and perceptions of EU regional policy’ of spring 2017 25 , the EUSBSR is the best known EU macro-regional strategy among EU citizens with 14% of them being aware of it. Meanwhile, the level of awareness at the Baltic Sea region level varies from 16% to 60%. The highest level of awareness has been recorded in Finland (60%), Estonia (51%) and Sweden (51%) where more than half of responds are aware of the Strategy. They are followed by Latvia (46%), Lithuania (31%), Poland (31%), Denmark (25%) and Germany (16%) 26 . The results of the Eurobarometer, showing a rather significant gap of awareness among the Baltic Sea region countries, should be taken into account when planning and implementing communication activities, especially at country level, as well as when updating the communication strategy of the EUSBSR (aiming to make communication more strategic, long-lasting and focused). The past few years have witnessed good progress in communication of the EUSBSR, in particular with the implementation of the ‘Let's communicate!’ project. Various activities have been carried out in the framework of the project leading to increased visibility of the Strategy and improved internal as well as external communication. These include - but are not limited to - creation of a blog platform on the EUSBSR website, active use of social media channels (e.g. Twitter, Facebook, Flickr), organisation of thematic events with various EUSBSR stakeholders - including with business representatives, production of a series of promotional videos on the EUSBSR, launch of communication toolkits for EUSBSR implementers (national coordinators, thematic area coordinators and flagship leaders), etc. Since the last report, certain steps have been taken with a view to developing an adequate monitoring system. 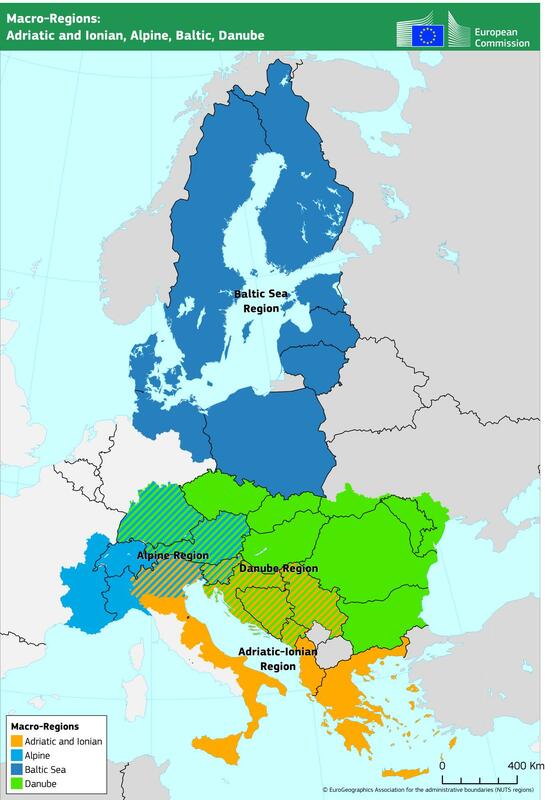 A macro-regional territorial monitoring tool is being developed by the ESPON 27 programme to continuously observe the development trends and patterns at the level of the four EU macro-regional strategies, including the EUSBSR, and for the whole EU. It is about identifying development opportunities and territorial challenges in order to present the MRS with insight on the need of reinforcing or reorienting their objectives and policies while bringing together statistical information and policy objectives. The policy objectives of the VASAB 28 long term perspective will be taken into account when it comes to the Baltic Sea region. A workshop on macro-regional territorial monitoring was held during the EUSBSR annual forum in Tallinn in June 2018 and there will be more stakeholder meetings are planned in late 2018. Development of a monitoring tool will allow monitoring better the progress made in implementing the Strategy towards the set objectives, targets and indicators and will provide a more solid basis for changes to be made with a view to improving the performance of the Strategy. Further work has been carried out in the ERDF Managing Authorities Network established in 2016. In order to provide a more practical discussion on cooperation and coordination modalities among the ERDF programmes, the network decided to focus initially on innovation, more specifically on smart specialisation in clean-tech. As a first result of the ERDF Managing Authorities Network, a pilot project – ‘Cleaner Growth 29 ’ – has been initiated, with the aim to develop transnational collaboration proposals to help regions implementing smart specialisation strategies focusing on clean-tech. Two pioneer projects will be pursued under the ‘Cleaner Growth’ umbrella: ‘Jointly Entering New Markets’ and ‘Commercializing Forest-Based Protein – Verification and Improvement of Protein Quality’. It is worth noting that there is already a growing interest to expand the cooperation within the Network in other areas (e.g. digitalisation and blue growth). Following the creation of the ERDF Managing Authorities Network, the Baltic Sea Network for the European Agricultural Fund for Rural Development (BSN-EAFRD) and a network for the Managing Authorities for the European Maritime and Fisheries Fund have been formed in 2017. The BSN-EAFRD Network aims to facilitate and strengthen transnational cooperation in the EAFRD in order to invigorate the link between the EAFRD and the EUSBSR. Currently the Network is working to align the contribution of the rural development programmes (RDPs) to the bio-economy with the EUSBSR. During bi-annual meetings, members of the network exchange ideas, for instance on common actions to develop bio-economy projects, analyse possible scenarios to facilitate transnational cooperation and possibilities to ensure coordination between RDPs. The above mentioned networks, along with the Baltic Sea Network – European Social Fund operational since 2011, reflect the need and wish for stronger macro-regional cooperation. The networks are good examples of joint planning and coordination and are to be used for enabling regional cooperation in the framework of national/regional programmes. For example: by coordinating themes for transnational cooperation, planning and developing joint transnational actions, projects and processes under the ESF, ERDF, EARDF and EMFF programmes 2021-2027. While these networks gradually are becoming more mature (in terms of mission and work plan), there is a need across all networks for more stable institutional support (such as for example Chairmanship and secretariat work) with a view to ensuring that they are sustainable in the long run. Embedding the Strategy into relevant existing policy frameworks remains an issue. Better integration of the EUSBSR in relevant EU, regional, national and local policy frameworks in the next programming period is needed in order to better utilise the potential provided by the Strategy. Since June 2018, the website EuroAccess, previously providing information on funding opportunities in the Danube region, has been relaunched and now includes information on over 200 EU funding programmes relevant for all four MRS. Potential applicants can look for open calls for project and filter results based on their type of organisation, their country of origin, and the thematic focus of their project idea, amongst others. This tool should facilitate the search of funding instruments to implement macro-regional projects and processes in the Baltic Sea region. Russia is already involved in some 20 flagship projects as associated partner (including four of the above projects presented in the box: ECOPRODIGI, EnviSum, BalticRIM and Baltic Science Network (BSN)). Furthermore, the EUSBSR has been able to create good contacts - for example via its Horizontal Action Neighbours 30 - with the regional governance in North-Western Russia and develop a positive environment from which to move into even more concrete cooperation. The signing of a financing agreement (in early 2018) between the EU and Russia concerning the participation of the latter in the Interreg Baltic Sea Region transnational programme, created a fertile ground for extended cooperation. Now Russian partners are now able to be full partners in the projects (not anymore just associated partners) and the cooperation can move to a more advanced level. This is a significant achievement of the EUSBSR. As a lesson learnt, it can be said that if the funding system is working, there are possibilities for cross border and/or transnational cooperation even in a challenging political situation. The cooperation between the EUSBSR and other macro-regional strategies has been further developed with a view to maximise mutual co-benefits and impacts. The cross-strategy cooperation has taken in different forms (e.g. implementation of joint projects, sharing of best practices and experience, etc.). The cross-strategy cooperation has been very much facilitated by Interact who organised several thematic meetings among partners coming from different macro-regions (e.g. on climate change and disaster risk prevention issues, transport-related issues, capacity building, etc.). Cross-strategy cooperation in the field of communication is also taking place with, for example, an annual EU MRS conference on media and communication organised in Slovenia for the first time in September 2017. The conference concluded, inter alia, in agreeing to enhance cooperation between the four strategies in the field of communication and to create a single horizontal pillar for all four MRS on media and communication focusing in particular on common content, participative process and innovative tools. Civil society is playing an important role in implementing the EUSBSR. Several thematic areas in the EUSBSR, in particular the policy area ‘Education’ and horizontal action ‘Capacity’, are co-coordinated by actors representing the civil society. The horizontal action ‘Capacity’, among other, aims at increasing the involvement of local and regional authorities as well as the involvement of civil society organisations in the implementation of the Strategy. Other thematic areas (e.g. bio-economy, education) also foresee some actions with the involvement of civil society. Moreover, representatives of civil society are also part of a number of flagships initiatives of the EUSBSR under several thematic areas. Following the example of the EUSDR, a participation day aimed at bringing together regional and local actors as well as representatives from civil society, academia, media and business, was organised for the first time in the Baltic in 2017 back-to-back to the annual forum in Berlin. The event proved to be a success and was repeated in June 2018, back-to-back to the annual forum in Tallinn. Though the Strategy continues bringing positive results, some challenges still remain and need to be overcome with a view to better utilise the potential of the Strategy. The challenges are interlinked and interdepended. Difficulties in finding new co-ordinators for certain thematic areas as well as poor representation of countries at some steering committee raise concerns about countries’ interest in certain thematic areas. Suboptimal involvement of line ministries continues to hurdle implementation of the Strategy and, therefore, should be improved. Too broad scope of the Strategy remains an issue and should be addressed in the upcoming revision of the EUSBSR Action Plan. A better focus, especially on the areas where macro-regional cooperation brings clear added value, would increase effectiveness and improve the success rate of the Strategy. This is also in line with the Council Conclusions on the 1st Report on the implementation of MRS of April 2017, stressing that a stronger result-orientation and a focus on relevant priorities is likely to increase the overall performance, as well as the visibility of the strategies. The current EUSBSR governance and annual forum support mechanisms are seen as too time consuming and putting too much administrative burdens on thematic area coordinators/organisers of the annual fora. Therefore, the support mechanisms need to be reconsidered and simplified. Steering groups should be strengthened with participation of all countries concerned and by turning them into real policy cooperation instruments. The same person should act as a focal point and a member of a steering committee of certain thematic area. This would bring more stability and would allow ensuring consistency of the position taken concerning the same matter. The stakeholders consider the EU funding sources (namely the ETC programmes, despite their limited resources) as the most important ones for the implementation of the Strategy. The national and other funding sources have been more difficult to obtain, which may illustrate the lack of political commitment in some Member States. It is critical for the future of the Strategy to find ways to embed cooperation and EUSBSR activities in the ESI Funds mainstream programmes. Efforts to access shared or centrally managed EU funds (ESF+, Horizon2020, Life, etc) as well as available national, regional and private funding sources should be continued and increased. Though in the past years good progress has been made in the field of communication, further efforts are needed to strengthen it, especially at country level and in national languages, as most of communication so far has been done in English. Communication in a national language would allow bringing the Strategy closer to citizens living in the Baltic Sea region, reach out broader audiences and people who are not yet aware of the Strategy as well as attract new actors to the Strategy work. With a view to making communication more strategic, coherent and impactful, common messages should be defined around certain big topics/themes relevant to the EUSBSR. These messages are to be framed (e.g. by the way of storytelling) in the national, regional and local context showing relevance of the messages to the people to whom they are addressed. Capacity building in communication should also be pursued allowing people responsible for communication of the EUSBSR to be equipped with rights skills and tools to do so. -Continue to foster cooperation between EU and non-EU countries around the Baltic Sea Region. -Strengthen the capacity of the actors involved in implementing the EUSBSR by developing the role of the steering committees and the flagship concept further. In the Presidency Conclusions of 18 June 2009, the European Council requested the Commission to prepare an EU Strategy for the Danube Region (EUSDR) 31 . The Commission adopted a Communication on 8 December 2010 (with annexed an Action Plan identifying concrete actions and examples of projects in 11 Priority Areas) 32 , which was then endorsed in April 2011 by the Council 33 . It is the second (in time) EU macro-regional strategy, after the EU Strategy for the Baltic Sea Region. The EUSDR unites 9 EU Member States (Germany, Austria, the Slovak Republic, the Czech Republic, Hungary, Slovenia, Croatia, Romania and Bulgaria) and 5 non-EU countries (Serbia, Bosnia and Herzegovina, Montenegro, the Republic of Moldova and Ukraine) and is home to 115 million inhabitants. A first Report to the European Parliament, the Council, the European Economic and Social Committee and the Committee of the Regions concerning the EUSDR was issued on 8 April 2013 34 . It was then followed by the 1st single report on the four MRS of December 2016. In the period referred to in this report, joint efforts continued to be undertaken to develop projects aimed at implementing the EUSDR Action Plan and achieving the targets set for each Priority Area. As the Interreg Danube Transnational Programme (DTP) became fully operational during this period, launching two calls for proposals as well as initiatives directly supporting the EUSDR (such as financial support to the Priority Areas and the Seed Money Facility instrument), it is not surprising that most of the projects referred to in this section are co-financed by the DTP. However, projects emerged also on the basis of other funding sources, such as Connecting Europe Facility (CEF), Erasmus+, 7th EU Framework Programme R&I (FP7), Interreg CBCs, mainstream ESI Funds Programmes and national funds. Whereas several projects initiated before 2016 continued to be implemented in 2017 and 2018, other projects were initiated in the past two years and their implementation will continue in the next years. In the framework of the FAIRway 35 project, co-financed by the Connecting Europe Facility, five new surveying vessels (three more coming up in 2018-2019) have been put in operation, five additional gauging stations in Croatia have been erected, a transnational Waterway Monitoring System (WAMOS) for consistent FAIRway data is being set up and additional fairway marking vessels are in the pipeline. An extremely important result of the cooperation within the EUSDR relates to the dredging activities, started in Summer 2018, on the Bulgarian-Romanian common section of the Danube River, since ensuring a minimum depth is crucial for allowing navigation when water debit is scarce. Cooperation also continued, in particular between Priority Areas 1A (navigation) and 11 (security) on the updated manual on cross-border controls and harmonisation of administrative forms, leading to a reduction in waiting times and to more effective control procedures. In the area of land transport, for the first time an overview of identified short-term transport strategic projects in the Danube Region (Transport Analysis for the Danube Region 36 – TAD) was carried out with the support of the European Investment Bank. This study is the first step towards developing a transport masterplan for the Danube region. As regards energy, within the DARLINGe 37 project, fifteen partners representing geological surveys, universities, industry, regional energy and development agencies, ministries and municipalities, work together to improve energy security and efficiency in the Danube Region by promoting the sustainable utilization of the existing, however still largely untapped, deep geothermal resources for the heating sector. Moreover, Priority Area 2 (energy) contributed to establish the Central and South Eastern Europe Gas Connectivity 38 (CESEC) and paved the way for identifying priority projects and corresponding financial sources for their realisation. This contributed to fund gas interconnectors between Romania and Hungary and between Poland and Slovakia, as well as to the funding of the LNG terminal in Krk, Croatia. These projects contribute to the security of supply of energy in the Danube Region, the competitiveness of energy markets, and the climate and environmental objectives pursued in the context of the Energy Union. In the area of tourism, the project CultPlatForm_21 39 was selected for co-financing by the Danube Transnational Programme. It aims at discovering hidden heritage and expanding cultural routes and initiating a cultural policy network in the fourteen countries of the Danube Region. Moreover, a project on cultural routes in the four macro-regions (Routes4U) was started in cooperation with the Council of Europe and is currently being implemented with the aim of enhancing the integration within macro-regions, including the EUSDR. Several projects have been implemented or developed in the area of water management and environmental risks, in particular those related to floods, which are being aggravated by climate change. JOINTISZA 40 concerns the first integrated Tisza River basin management plan. The DanubeSediment 41 project aims at ensuring sediment balance in the river system. The reliable and comprehensive hydrologic data is the basis of sound forecasting in view of flood risk mitigation in order to better the protect human lives and the social estate; DAREFFORT 42 will deliver an outstanding overview about the present status of the national forecasting capabilities. SIMONA 43 aims at delivering ready-to-deploy Sediment-quality Information. Thanks to cooperation within the EUSDR, a civil protection mechanism was activated, supported by DG ECHO, in order to tackle pollution of the Tisza river from the abandoned Solotvyno salt mine in Ukraine, with transboundary effects in Romania and Hungary. Ecological connectivity is the focus of the TRANSGREEN 44 (promoting green infrastructures in the Carpathian region, a project which allows also cooperation with the Carpathian Convention), ConnectGReen 45 (improving the ecological connectivity between natural habitats, especially between Natura 2000 sites and other protected area categories in the Carpathian ecoregion of transnational relevance) and MEASURES 46 (establishment of ecological corridors for sturgeons and other migratory fishes). Tackling invasive alien species in the Sava River basin (the largest tributary of the Danube) is the focus of SavaTIES 47 project. Several networks and task forces dealing with transboundary environmental issues continue to be very active in the Danube Region thanks to the Danube Strategy, such as the Danube Sturgeon Task Force and DANUBEPARKS 48 . Important projects which involve non-EU countries have been realized under the umbrella of the EUSDR, such as the complex water management development of the area of the Baja-Bezdan Canal (between Hungary and Serbia) and the “SAFETIZSA” project (between Hungary and Ukraine), with respectively ca. 8 million Euro awarded by IPA CBC and 4 million Euro awarded by ENI CBC programmes. A remarkable achievement of the Danube Strategy is the establishment of the Danube Funding Coordination Network, which promotes joint funding actions on Research and Innovation. A first pilot multilateral call on scientific and technological cooperation for 2017-2018 was launched in 2016 and a second call is currently in preparation. Through joint calls, existing bilateral agreements on scientific cooperation are open up to multilateral cooperation, leading to a more effective and strategic use of the available funds. The networks on R&I set up in the framework of PA 7 (knowledge society) also allowed to enhance the collaboration in the framework of COST and EUREKA, strengthening the ties between research communities. The development of a Joint Bio-based Industry Cluster Policy Strategy (JBCS) as well as a bundle of new methods and tools to support clusters for transnational working is being developed in the framework of the Danube BioValNet 49 project. The Made in Danube 50 project aims at building fifteen sustainable bioeconomy-based innovation partnerships involving forty regional companies, contributing to the competitiveness of SMEs in the South-Eastern Danube Region as well as generating significant change for the entire area by supporting regional Smart Specialisation Strategies. In the area of People and Skills, cooperation efforts continued, leading to several fruitful joint initiatives and projects. A centre to implement dual vocational training in the professions needed by the construction industry was set up in Chisinau (Moldova) with the support of Austrian public (ministry for Labour, Social Affairs, Health and Consumer Protection) and private (STRABAG) funds. With Danube@work 51 focus is put on digitalisation of work and related opportunities. EDULAB 52 brings together partners from the higher education sector, business organisations, national public authorities and policy makers to link education and employment in the region in a sustainable way. CODES – Competence-Oriented Education for Elementary Schooling - aims at building cross-border cooperation of educational institutions, with a view of strengthening key educational competencies. The eGovernance renaissance project aims at creating an education platform on processes in public administration for students of EUSDR countries. Joint initiatives on security in the framework of DARIF 53 (Danube River Forum) continued. In 2017, illegal fishing and breaches of waterway transport rules have been under the spotlight. Cooperation on bomb disposal is being organised around the Central European CBRN-E Training Centre located in Hungary. The Bavarian police developed the Danube Domestic Burglary Project 54 (DDBP) as a follow up to the Danube Property Crime Project 55 (DPCP) in cooperation with authorities of Serbia, Austria and Europol. Cooperation between the Priority Areas “security” and “navigation” continued on the basis of the jointly developed “Manual on border controls” and “Recommendations for improved border controls”. Based on European Parliament Funds, a “Danube Strategic Project Fund” was set up in 2017 and used for the support of twelve projects of strategic impact, especially in view of Enlargement and Neighbourhood policies, and fostering integration and reconciliation of Danube countries, with a particular focus on the training of young people. In the framework of the Priority Area dealing with institutional capacity and cooperation, based on technical assistance fund, the database and search tool EUROACCESS 56 , created initially in 2016 for the EUSDR, was further developed and extended to other macro-regions. In order to facilitate integration among bordering countries, an initiative on border cadastre and land registry aiming at identifying and possibly harmonising legal requirements was launched. Both Moldova and Ukraine have adapted their administrative services in order to enhance their participation in the EUSDR activities. Several initiatives and projects developed within the EUSDR have a significant impact on policies – or derive from and implement sectoral policies, including crucial EU policies, as in the areas of transport, energy and environment. The link between projects and policies is extremely important since policies need to be fed with concrete project results and, in turn, they set the conditions for successful projects and joint initiatives. Several examples can be mentioned. The activity of Priority Area 1A (navigation) led to several ministerial conclusions, contributing to enhance the political focus on the underlying projects. EUSDR-related activities led to higher visibility of policies and improvement of coordination between national administrations (e.g. in the area of security) or with existing international organisations (e.g. ICPDR, Danube Commission, Carpathian Convention). Priority Area 1B (land-transport) stimulated discussions at political level on the Balkan Rail Freight Corridor. Joint activities of Priority Area 5 (environmental risks) contribute to implement the EU adaptation strategy to climate change as well as the flood Directive. Initiatives in the field of energy contribute to de-carbonisation of energy production, one of the main goals of climate policy. EUSDR-related activities also helped shaping national activities by adopting a transnational approach (e.g. in the case of national programmes against natural disasters in several countries, or the road planning along the Slovenian coast). The European Parliament acknowledged the political relevance of the ongoing initiatives and provided funds for pilot projects and innovative actions. Candidate and potential candidate countries find in the EUSDR a reliable platform to help them paving their way towards EU integration. Their participation in the EUSDR governance on an equal footing with EU Member States help them to get familiar with the EU working methods, hence to prepare for EU membership. Similarly, the participation of ENI countries (Moldova and Ukraine) in the EUSDR-related joint work – which had intensified significantly in the years 2016 to 2018 - facilitate the implementation of their EU Association Agreements. Finally, it has emerged that the EUSDR contributes to effective multi-level governance and, ultimately, helps building a solid ground for anti-nationalistic agenda. The integration and growing alignment of the EUSDR with the Danube Interreg Transnational Programme (DTP) in 2017 and 2018 greatly helped conceiving, developing and co-financing projects implementing the EUSDR Action Plan. A total of 76 projects of direct relevance for the EUSDR were approved during the first two calls of the DTP. The DTP also launched a Seed Money Facility tool, specifically dedicated to project ideas stemming from the EUSDR. On 18 July 2018 the Monitoring Committee approved 19 small scale projects for funding under this scheme. In addition to the DTP, which is the most relevant source of financing of EUSDR-related project but which – in light of the limited budget – is constrained to projects with relative small budget (around 2 million € in average), other funds have been used in order to finance projects. The most relevant additional funding sources in the years 2017-2018 have been CEF, mainstream ESI Funds OPs, Cross-Border-Cooperation Programmes as well as national funds. Moreover, projects have been co-financed by Erasmus+, FP7 and ESF. As regards mainstream OPs, the alignment of funds with the EUSDR varied in the different participating countries. As was the case of the previous implementation report, a checklist was sent to Managing Authorities of around 100 programmes in the Region to assess their contribution to the Strategy. The reported figures that show the programmes` contribution to the Strategy has significantly increased from about EUR 532,467,926 to about EUR 2,583,767,072 €. It must be highlighted, however, that the approach of individual programmes on evaluating how and to what extent a project contributes to the EUSDR’s objectives differs. This may only lead to a rough estimation of funds contributing to the Strategy. In order to highlight some ways on how programmes approached macro-regional cooperation, the following examples can be mentioned. Romania earmarked EUR 383 million to the EUSDR from the budget of the Regional Operational Programme and provided for additional bonus points for EUSDR projects in the Large Infrastructure OP. Bonus points for EUSDR relevant projects were also used in the Romania-Bulgaria CBC programme. In Bulgaria, the transport infrastructure OP finances with EUR 10 million the purchase of multifunctional dredging equipment. The Bulgarian Human Resources and Regions in Growth OPs also contributed to achieve EUSDR-related targets. Slovenia indicated that embedding in OPs in 2017 led to a contribution of EUR 205 million for the three MRS in which it takes part. In Baden-Württemberg, two funds specifically dedicated to EUSDR have been established, projects have been supported with EUR 4.3 million leveraging around EUR 4.8 million more from third parties. In 2017 and 2018 there have been considerable improvements on cooperation between sectors of the EUSDR as well as with other organisations. In addition, synergies and cooperation have been achieved between Priority Areas of different MRS, thanks in particular to the coordination efforts successfully undertaken by the INTERACT programme. The manual and recommendation for border controls is a tangible result of cooperation between Priority Areas 1A (navigation) and 11 (security). Priority Area 11 also initiated cooperation with the Danube Commission on security of navigation. Cooperation between the ICPDR and Priority Areas 4 (water), 5 (environmental risks) and 6 (biodiversity) continues to bear fruits and benefits to all parties involved. A memorandum of cooperation between the Secretariat of the Carpathian Convention and Priority Areas 1B (land transport), 2 (energy), 4 (water), 5 (environmental risks) and 6 (biodiversity) was endorsed and forms the basis of projects of joint interest (such as TRANSGREEN). Overall, although several examples of good cooperation among Priority Areas and with other organisations are identified, potential for further improvement remains. As regards the governance of the EUSDR, the system developed since 2014, with rotating presidencies supported by a “Trio” (incumbent presidency, past and future presidency) continued to give good results, in particular for the work of the National Coordinators and Priority Area Coordinators. Since 2017 the DTP (the Interreg Programme which matches exactly the geographical area of the Danube Strategy) has taken over the financial support to the Priority Area Coordinators (PACs) of the EUSDR. The transition, initially looked at with some preoccupation by PACs, fearing an increase of bureaucratic tasks in order to obtain the funds, was managed smoothly. All PACs have expressed appreciation for the simplification of reporting requirements (in particular e-reporting). Two joint meetings of EUSDR National Coordinators and Monitoring Committee of the DTP, in 2017 and 2018, paved the way to launch a specific DTP call for the set-up of a new Danube Strategy Point as from late 2018. The DTP has effectively contributed to make this delicate and important process a success. Within Priority Area 3 (Tourism) a joint structure to facilitate and support the work of the Bulgarian and Romanian Coordinators was set up in 2016, with seat in Ruse (BG). Civil society has been actively included in meetings of certain steering groups of Priority Areas as well as in events and annual fora. As regards Priority Areas, some rely heavily on technical input by civil society (e.g. the Tasks forces in the framework of Priority area 6 – Biodiversity) for other Priority Areas (e.g. 1B - land transport), civil society participation is more concentrated to conferences and events. Participation Days were organised nationally and back to back with annual fora. The Hungarian and Bulgarian Presidencies of the EUSDR organised events dedicated to civil society, such as the International Danube Day and the photo competition “one day on the Danube”. A forum of citizen prior to the annual forum held in 2017 was organised by Hungary and the results of the event were echoed by the annual forum held in Budapest the same year. Representatives of Academia are regularly in involved via Priority Area 7 (knowledge society) and those of local authorities via the Council of Danube Cities and Regions and the Danube Local Actors Platform supported by Priority Area 10 – institutional cooperation. There is a widespread consensus among the main actors of the EUSDR that, despite undoubted recognition of the importance of the Strategy, its achievements and potential, the political momentum around the Strategy is somehow declining and there is a need to re-boost it, in particular renewing ownership and commitment by the participating countries. The current participation (both quantitative and qualitative) in the Steering Groups of the Priority Areas is unsatisfactory, which generates frustration by several PACs. Although a certain rate of turnover is physiological, in some cases participating countries have failed to re-appoint national coordinators and/or members of Steering Groups after changes have occurred. Certain participating countries have not had a National Coordinator or members of Steering Groups for as long as some years. Moreover, in several cases participation to Steering Group of Priority Areas is quite passive and does not contribute to the identification of projects and initiatives of common interest. Certain PACs maintain that some of the actions foreseen in the Action Plan cannot be achieved due to the current low level of participation in Steering Groups. In this context, it has been mentioned by several National and Priority Area Coordinators that the participation of the line-DGs of the European Commission to the work of the Priority Areas is also varying and there is room for improvement. The already started process aimed at revising for the first time the Action Plan of the EUSDR offers the opportunity to tackle these challenges. It allows to look at the current priorities and identify needs for change, including, where appropriate, new Priority Areas or the application of sunset clause for existing ones, or the grouping of existing priorities within the same pillar. In addition, the revision of the Action Plan offers the occasion to re-discuss, after seven years, the allocation of coordination roles of Priority Areas, taking also into account the wish expressed by countries which currently do not hold such a role, to acquire one. Although rotation of PACs should only be implemented on a voluntary basis, it is necessary to find solutions in order to renew ownership and tackle low participation in Steering Groups as well as to involve new actors in coordination roles. Many actors are concerned by the difficulties of monitoring the results of the EUSDR by clearly distinguishing between projects and initiatives originating from the EUSDR itself and those which would have been developed independently on the EUSDR. This uncertainty makes it difficult to communicate the results of the Strategy. Consequently, there is wide agreement that the ongoing revision of the Action Plan must be based on a sound evaluation of the results and that new actions and projects must be to the maximum extent possible measurable. On the other hand, it should not be forgotten that the EUSDR, like all MRS, is not a cooperation programme, but a political platform for cooperation, without a clearly identified baseline. It is a fact that, in addition, the EUSDR leads to several non-tangible results, such as an improved culture of cooperation, greater capacity of administrations to coordinate policies internally and to think beyond administrative and political borders: all elements which, per se, cannot be measured, but which are clearly part of the EUSDR’s assets. Completed studies on macro-regional strategies such as the COWI 57 study in 2017 and currently ongoing initiatives such as the ESPON study are useful as they contribute to improve the monitoring of the result of the strategies. The absence, since 2017, of a common body fully dedicated to supporting EUSDR governance is widely recognized as having hampered the smooth development and implementation of the Strategy, in particular in relation to coordination between the different Priority Areas, technical support as well as communication (in particular through weekly update of the web site). The experience of the Danube Strategy Point (DSP), set up in 2015 and discontinued in 2017, showed - despite not all tasks of the DSP were equally fulfilled - the importance of having such a dedicated body in the EUSDR, due to the complexity of the actions foreseen by the Strategy, the scale of the common initiatives and projects and the wide geographical coverage of the EUSDR. As mentioned in the previous section, a new DSP was successfully selected and is expected to become fully operational by the end of 2018, which will be of great benefit to the EUSDR. Another critical issue relates to the administrative staffs dedicated to the EUSDR by the participating countries, which does not always allow fulfilling the objectives of the Strategy. Despite regular statements – at annual fora or ministerial meetings – a gap remains between those statements and the staff and resources which are actually devoted to the EUSDR. Despite the growing number or projects and initiatives being financed, in particular by the DTP, as well as the efforts accomplished by some participating countries to embed the EUSDR priorities into mainstream OPs and national funds, the situation remains unsatisfactory. The awareness of the benefits of MRS should be raised among the possible funding programmes. Programmes at different levels differ in terms of their geographical focus or refer to the diverse legal status of the partner countries (e.g. EU and non-EU). The lack of understanding of the added value of the macro-regional cooperation might lead to further challenges for innovative partnerships and hinder joint actions. DG REGIO organised in February 2017 a study-visit for Romanian Managing authorities. It was the occasion for several Managing authorities to learn about the practical implications of the EUSDR and develop ideas in view of increasing the absorption rate. This initiative from Romanian authorities deserves to be welcomed and should be extended to other participating countries, especially in those where mainstream OPs do not see their relevant role in the macro-regional cooperation. Several National Coordinators asked for a reformulation of the “3 Nos” principle in order to provide to the EUSDR a greater funding security for implementing the initiatives which are jointly conceived. On the other hand, the very essence of MRS is to trigger the use of funds from other sources, rather than to implement projects with own-funding. The matter, in any case, remains the subject of lively debates, as long as the gap between the Strategy and funding will remain significant. The benefits of the EUSDR for the territory are not always sufficiently visible and this creates frustration at the level of Priority Areas. It is common understanding that, in light of the strategic character of the EUSDR, targeted communication initiatives are necessary. On the other hand, evidence shows that when communication tools are available, the EUSDR features higher on the political agenda at national or local level. -Enhance exchange of experiences among programmes that are already funding, or plan to fund, macro-regional relevant projects, even across macro-regional strategies. -Promote actions, in line with the EUSDR priorities, that bring added value to the EU enlargement process in Western Balkan countries. -For the next generation of the transnational programme dedicated to the EUSDR, find a better balance between IPA and ERDF funds. At the time when this Report is published, the European Union Strategy for the Adriatic and Ionian Region will be entering its 5th year of implementation. The EUSAIR was endorsed by the European Council in October 2014 58 , on the basis of a Communication 59 on the EU Strategy for the Adriatic and Ionian Region and its accompanying Action Plan adopted by the Commission in June 2014. The Strategy incorporates the Maritime Strategy for the Adriatic and Ionian Seas, adopted by the Commission in November 2012 60 , which is mainly dealt within the thematic Pillar I (Blue Growth). The Strategy was developed around the Adriatic and Ionian Region seen as a functional area, inhabited by about 70 million people. It builds on the inter-governmental Adriatic and Ionian Initiative (AII), launched in 2000, which concerns 8 countries - 4 EU Member States (Croatia, Greece, Italy and Slovenia) and 4 candidate and potential candidate countries (Albania, Bosnia and Herzegovina, Montenegro and Serbia). The Strategy thus benefits from traditional cooperation among stakeholder networks (e.g. fora of cities, universities and chambers of commerce) established since the beginning of the 2000s on both sides of the Adriatic and Ionian seas. More networks were established later on. The launch of the EUSAIR back in the autumn 2014 raised high expectations, among implementers, stakeholders and citizens, of immediate tangible results in terms of strengthened cooperation and macro-regional actions and projects. However, the very nature of macro-regional strategies requires a change of mind-set among key implementers and stakeholders, asking them to leave aside a purely national logic and, instead, to think and act in the interest of the entire Region. Since this is clearly a process that takes time, tangible results are unlikely to come about in the short run. Accordingly, while the Strategy has now been in existence for four years, results visible to external stakeholders remain few. Internally, however, in addition to fully operational governance bodies, noteworthy progress has been achieved as regards understanding of potential benefits of strengthened collaboration and networking, not to forget a growing sense of community when broaching common concerns at a wider policy level. The participation of enlargement countries in the EUSAIR governance on an equal footing with EU Member States is to be considered a capacity building process accustoming them to the EU working methods and preparing for their future EU membership. According to the COWI 61 report, at the moment of its delivery (November 2017), the EUSAIR was to be considered still in its first phase of maturation 62 (activities related to the set-up of the MRS, capacity development, etc.). Nonetheless, considering the developments occurred since then, it would be more appropriate to place now the EUSAIR in phase II (operating phase, ability of the MRS to manage joint structures, ability of stakeholders to establish joint structures, etc.). All four Thematic Steering Groups – though at a different level of development - identified preliminary lists of priority actions and projects within their respective pillars, acknowledged to have a distinct macro-regional added value and to contribute to the implementation of the EUSAIR Action Plan. These shortlisted actions and projects are now at different stages, going from project ideas to be developed from scratch to bankable projects ready for funding as well as projects already been funded - including through the Interreg Adrion transnational programme - and currently in their implementation phase. Under Pillar 1 “Blue Growth”, a number of project proposals is currently under evaluation by TSG 1 as concerns their macro-regional value and contribution to the achievement of the Pillar’s objective. These proposals span from project ideas, to mature projects ready for implementation, up to projects already under execution. Examples of the latter include projects financed by the Interreg Adrion programme, like the NEORION 63 project, promoting green maritime technologies and new materials to enhance sustainable shipbuilding, or the ARIEL 64 project, promoting transnational networking among small scale fisheries and aquaculture enterprises in the Adriatic-Ionian region. Pillar/Thematic Steering Group (TSG) 1 is also working closely with Pillar/TSG 3 on topics of common interest, e.g. Maritime Spatial Planning. Pillar 2 “Connecting the Region”, is dealing with Transport and Energy networks. Concerning the former, the TSG 2 subgroup “Transport” has so far selected 43 projects/measures meant to contribute to the implementation of the Strategy’s Action Plan: 30 are infrastructural projects while 13 are “soft” measures. Projects encompass initial project idea – which needs to be further developed – and “bankable” projects ready for funding. An example of the latter is the ADRIPASS 65 , a project funded under the Interreg Adrion programme aiming at promoting efficient maritime – hinterland connections by analysing physical and non-physical bottlenecks on the TEN-T corridor sections of the region. Another example of project is the Motorway of the sea Venice-Patras 66 , which has be approved for financing under the Connecting Europe Facility. The “Transport” sub-group is also engaged in the establishment of a Transport masterplan for the EUSAIR region. The aim of the masterplan is to create synergies among national plans and investment programmes in the light of a common macro-regional strategy on connectivity, accessibility and inclusion. The masterplan should allow to identify areas of intervention where common actions and shared decisions need to be undertaken. The TSG 2 sub-group on “Energy networks” has so far reached consensus on a first open list of 10 projects with a macro-regional value. This list includes both initial project concept requiring further development (example: “Eastern Mediterranean Gas Pipeline”) and mature projects, some of them already under (partial) implementation (examples: “EUSAIR Power Exchange” aiming to create the conditions for an efficient energy market in the region, or the “LNG Logistic and Planning” for the coordination and harmonisation of initiatives regarding LNG use as a fuel for marine transport). The “Energy networks” sub group is also considering the setting up of a Master plan regarding energy infrastructure needs in the region. Finally, both “Transport” and “Energy networks” sub-groups are willing to engage in structured dialogues with international financial institutions to discuss funding options for the projects shortlisted. Under Pillar 3 “Environmental quality”, TSG 3 is working to identify an initial list of projects that should be agreed by consensus by the participating countries. Efforts are also made to develop cross-pillar projects on themes like: “combining Integrated Coastal Zone Management and Maritime Spatial Planning” as inclusive and complementary governance tools; or “large-scale pollution contingency plans”. TSG 3 has also developed a matrix covering the four Pillars. Its aim is to provide the TSGs with a tool which would allow to screen their project proposals with a view to assess synergies or conflicts with the other Pillars. Concerning Pillar 4 “Sustainable tourism”, TSG 4 selected six priority topics (out of the fifteen included in the Action Plan – Pillar 4) on which focus its initial activities. In that framework, criteria were established through which project proposals could be assessed. So far, in two rounds, 8 + 21 project proposals were evaluated (examples: "Innovative region for an innovative tourism - Enhancing the regional SME skills and competitiveness"; “WineSenso"). Projects identified should be further supported with a view to help them finding the funds needed for their implementation. TSG 4 is also preparing cross-pillar project proposals: on “Managing Tourism Flow in Protected Areas” (with TSG 3) and on “Sustainable Infrastructure: Promotion of a Quality oriented, Sustainable Tourism Offer in EUSAIR Destinations” (with TSG 2 and 3). Finally, TSG 4 is also playing an active role in contributing to the 2018 EU-China Tourism year and the 2018 European Year of Cultural Heritage. In this context, possibilities for cooperation and funding are considered with the UNWTO and the Council of Europe. Regarding the latter, TSG 4 submitted proposals to the Council on the development and accreditation of two cultural routes, namely: "the Olive Trees route" and the "Roman Emperor route". Definition of an effective governance structure and establishment of the instruments supporting it, took much time and efforts. Now that the governance architecture is in place, the Governing Board (GB) and TSGs should make all possible efforts to stimulate the development of projects and actions with macro-regional added value and give a boost to implementing the Action Plan and its objectives. ·After three years of GB co-chairmanship, the Commission stepped back leaving full chair responsibility to the country holding the EUSAIR (rotating) Presidency. In doing so - after the initial start-up period of the Strategy - the Commission wanted to align with the practices in force in the “older” MRS so as to enhance ownership on the side of the rotating Presidency. ·Two capacity-building workshops took place in Spring 2018, organised by the Facility Point Plus project. The primary purpose of the two events, targeting respectively the TSG members and the National Coordinators, was to improve their capacity to identify jointly and agree on actions benefitting participating countries. Further capacity building activities are planned in the near future. At implementation level, the TSGs continued to meet regularly. However, participation from countries representatives is often lacking. Nonetheless, they made progress in identifying priority projects per pillar. They should now focusing on promoting the implementation of those projects which, in many case, require financing, but also administrative/technical coordination among national/regional authorities. ·Outlining concrete avenues of action for helping strengthen the resilience of EUSAIR participating countries in coping with the refugee and migration issue. In 2017, the Commission mandated the Organisation for Economic Co-operation and Development (OECD) to review the arrangements put in place by the EUSAIR countries for implementing the Strategy. The purpose of this review – still on-going – is to help streamline and improve horizontal (cross-sectoral) and vertical coordination within and between national and regional administrations in each country in light of good practices. Initial findings point to a variety of arrangements put in place; a number of participating countries have thus established internal coordination systems involving ministries of foreign affairs, authorities in charge of EU funds, sectoral ministries and regional/local administrations. The review should also formulate recommendations as to how shortcomings observed could be overcome 67 . The 2nd and 3rd EUSAIR fora, respectively in 2017 and 2018, offered important opportunities for raising awareness of the Strategy and for increasing its visibility. In both cases, a significant number of stakeholders, national, regional and local administrations, the business sector as well as media, took stock of progress achieved, discussed challenges facing the Region and exchanged ideas and experience on projects, actions or activities of macro-regional relevance. The 2nd EUSAIR forum in Ioannina, under Greek Presidency, focussed on “Blue Growth and its interrelations with other EUSAIR pillars: Environmental Quality, Sustainable Tourism and Connecting the Region”. Both the plenary sessions and sectoral and side-meetings registered high attention and interest on the matters discussed. Overall, the forum was successful in attracting more than 600 participants. There was a clear perception that although much remained to be done, the Strategy was going in the right direction. Concerning the 3rd EUSAIR forum held in Catania, under Italian Presidency, special attention was paid to “improvement of connectivity as a booster for successful development of the area”. The plenary sessions, parallel meetings (one per pillar on financing opportunities) and numerous side events (on eco-connectivity, LNG, resilience to natural disasters, migration, etc.) raised a mixed level of interest, also due to the late announcement of the events. As for the first EUSAIR forum, a Business to Business (B2B) side event was organised both at the second and third forum by the Enterprise European Network (EEN). In both cases the event was successful with a high number of participants (240 in Ioannina and 190 in Catania), mainly SMEs, business associations and agencies and some academic research centres and regional and national public authorities. The number of business meetings was also very high and was boosted in the case of Catania by the presence of 22 Chinese tourist operators invited in the framework of the EU China Tourism Year 2018 (ECTY 2018) and by the fact that, after three years of implementation of the EUSAIR, stakeholders are more aware of opportunities offered by the Strategy. Stakeholders have generally contributed a good deal to the EUSAIR fora. However, much remains to be done to increase their participation in implementing the Strategy and their interaction with governance structures. So far, the commitment of the fora of universities, chambers of commerce and cities working under the umbrella of the AII continues to be sustained and will be further enhanced in the framework of the AI-NURECC 68 initiative in cooperation with the Conference of Peripheral Maritime Regions of Europe (CPRM) and the Adriatic and Ionian Euro-Region. This pilot project – decided at the initiative of the European Parliament - aims at supporting the EUSAIR strategy implementation via a number of initiatives in the fields of youth action, cultural and creative industry, tourism and training. AI-NURECC actions will also contribute to strengthen cooperation between the EU and the enlargement countries involved. The four EUSAIR pillars being interdependent, macro-regional actions and projects must be coherent and mutually supportive. Actions and projects carried out under each pillar should complement and reinforce the impact of those carried out under the other pillars 69 . Moreover, many projects identified by the TSGs, particularly those related to environmental protection, cannot be restricted to one pillar only as they are, by their nature, cross-pillar. For this reason, TSG 3 has consistently stressed the need to establish more active cross-pillar coordination. The matrix it produced highlights synergies and complementarities but also possible incompatibilities between objectives pursued under the different pillars aims. This is expected to make it easier for each TSG to spot opportunities for fruitful inter-pillar cooperation and to identify actions common to more than one pillar. Such inter-pillar initiatives could be developed with the support of the Facility Point Plus project, which aims at supporting the development of project ideas and concepts relevant to more than one pillar and at turning them into more mature, bankable projects. Coordination among pillars continues to be ensured also through “Technical meetings of Pillar Coordinators” facilitated by the Commission and preceding GB meetings. The GB and TSGs continue to have a special relationship with the Adriatic and Ionian Initiative 70 . The AII Round Tables, overhauled after the endorsement of the EUSAIR, have attempted to act as interfaces between TSGs and regional stakeholders and to increase their participation in the EUSAIR governance processes. However, to bring real benefit, this instrument needs fine-tuning and better coordination with the work of the TSGs. The TSGs have continued to consider and find complementarities with the work of sectoral regional and international organisations on matters of interest for the EUSAIR. This concerns, for instance, the search for synergy and cooperation of TSG 1 with the Union for the Mediterranean on the Blue Economy; of TSG 2 with the SEETO and the Energy Community; of TSG 3 with UNEP/MAP and the Barcelona Convention: and of TSG 4 with UNWTO and the Council of Europe. Finally, cooperation and coordination with the Conference of Peripheral Maritime Regions of Europe has increased in the framework of the mentioned AI-NURECC initiative where they act as lead partner. Macro-regions are not closed systems; they need to interact and coordinate across their borders, notably in the case of transport, energy networks, tourism or environment protection. Accordingly, coordination, cooperation and exchange of information with other MRS is essential for the coherence and for the effectiveness of the EUSAIR, all the more so that most EUSAIR countries are also member of other MRS 71 . The fact that several GB and TSG members are also involved in the EUSDR helps compare systems, exchange experiences and good practices and find complementarities and possible synergies among MRS. In this respect, it is worth mentioning the “Mediterranean Coast and EU MRS Week” organised by the Slovenian Government each year since 2016. This event brings together experts, stakeholders and the general public to discuss issues connected to the implementation of the MRS with the aim to enhance coordination among them as well as communication. As far as funding and alignment of ESI/IPA funds with the EUSAIR are concerned, it is worth noting that constructive relations have been established between Pillar Coordinators and the Interreg Adrion Monitoring Committee. Suggestions by Pillar Coordinators were considered to shape the Adrion 2nd targeted call for proposals. The picture is somewhat different as regards the contribution of mainstream (national, regional) programmes to the EUSAIR. Even though most country-specific ESI Funds programmes implemented in the Region indicate that they contribute to the Strategy, coordination among the authorities managing these programmes in the EUSAIR countries for the purpose of carrying out joint or parallel projects serving the same macro-regional objectives, is still lacking. Some indication on the support provided by ESI Funds and IPA programmes to the EUSAIR can be found in the section “Contribution of programmes to macro-regional strategies” at the end of this document. 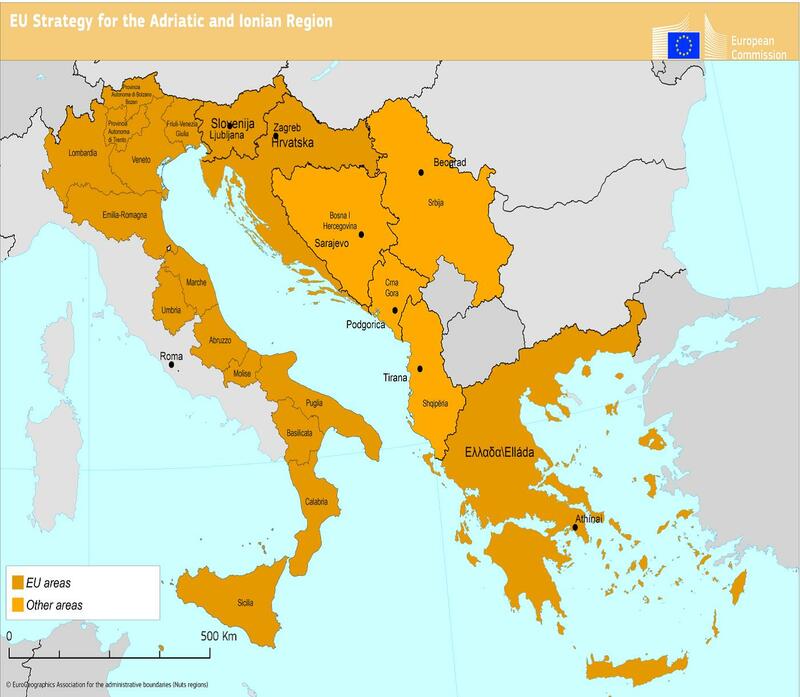 The Adrion programme - which covers the same geographical area as the EUSAIR and the priority axes of which are largely aligned with the Strategy’s objectives - as a result of its first call for proposals has funded 34 projects under its three priority axes (1 Innovative and Smart Region; 2 Sustainable Region; 3 Connected Region) for a total budget of EUR 33.1 million. Projects are now under implementation. A second call for proposals was launched in March 2018 covering only Priority Axis 2 (e.g. environment and tourism/cultural heritage) with an overall budget of about EUR 34.3 million. Generally, assessment of how the implementation of the EUSAIR Action Plan is being carried out is a task for Pillar Coordinators, due to report on their activities and achievements to the GB once per year. As from 2018, the Facility Point, under Greek leadership, is complementing the Pillar Coordinators work by developing a more in-depth monitoring and evaluation system, collecting data, building a knowledge base, establishing baselines, indicators and targets and working on an annual monitoring report. Communication is an important aspect of the Strategy. It helps raise awareness and visibility among stakeholders and citizens. Communication activities are being carried out by the Facility Point. Its activities include keeping the official web-site up-to-date, communicating on social media, launching online campaigns, publishing information videos, organising public events, etc. While learning how to operate under a newly created governance architecture does not happen overnight, the persistent gap, after four years of existence, between political commitment as expressed in ministerial declarations and actual follow-up at the administrative level, calls for reconsidering the governance set-up. The Facility Point - now largely (though not entirely) operational - cannot replace national administrations which, as requested several times by ministers in their annual declarations, must provide adequate human, financial, administrative and technical resources dedicated to the implementation of the Strategy. Ownership of the Strategy by the participating countries, considered a must ever since its launch, needs to be considerably strengthened. The Commission’s step down as co-chair of the GB as of February 2018 is a move in that direction. The role of the Commission remains no less significant as it keeps its function of strategic coordinator. However, at the coordination level, it is now high time for the pro-tempore Presidency to take the lead and give a boost to the implementation of the Strategy in cooperation with all National Coordinators and with the support of the Facility Point in all its territorial dimensions. The newly established “Trio Presidency” is a good move in that direction as it can be expected to foster stability and continuity as well as provide additional support to the rotating Presidency; it nevertheless needs being put to the test. As noted by some Pillar Coordinators, at the implementation level, the repeated absence of some countries in TSG meetings continues to be a problem hindering effective functioning of the TSGs. The reasons behind it are, on the one hand, persistent lack of clear mandate given to TSG members, leading to poor empowerment (in some cases) and, on the other hand, insufficient continuity and stability of TSG members, owing to frequent administrative reorganisations resulting in positions remaining unfilled for lengthy periods of time and unexperienced staff taking over the position of TSG members. As far as the substance of their work is concerned, it has to be noted that, even though TSGs produce lists of prioritised projects, there is still uncertainty as to how these EUSAIR -labelled projects are considered by EU funding programmes. The Stakeholder Platform, to be developed under the Facility Point, is not ready yet. Both key implementers and stakeholders are repeatedly asking for it as it is expected to ensure a more direct flow of information to and from stakeholders, better communication and possibility to share experiences, best practices and build new partnerships. A new challenge - both at coordination and implementation level - in the coming months might result from the possible accession of the former Yugoslav Republic of Macedonia in the EUSAIR - after its inclusion in the Adriatic and Ionian Initiative - as requested by the EUSAIR/AII ministers in the Catania Declaration of 24 May 2018. Both the Dubrovnik and the Ioannina Declaration pay considerable attention to the migration and refugee challenge. Participating countries committed to exploring ways in which the Strategy could contribute to strengthening the resilience of Adriatic and Ionian countries in this respect. The proposal, mentioned in the Ioannina Declaration, to set up a collaborative platform to coordinate better the eight countries’ response to the migration issue and to consider an expansion of the EUSAIR Action Plan to include integration of migrants in the labour market, has not been followed up upon yet. As far as the funds for implementing Strategy’s measures and projects, over and above the important but small Adrion programme, it would be necessary for participating countries to find common grounds on procedures that would allow easier access to support from larger ESI Funds/IPA programmes, as well as EU funds under direct management (Horizon 2020, LIFE, etc.). The need to balance EU funds potentially available to EU and non-EU countries for EUSAIR measures and projects has been voiced repeatedly by several National Coordinators. Dialogue meetings, promoted by DG REGIO, between ESI Funds Managing Authorities and EUSAIR key stakeholders in the four EU Member States, took place between October 2016 and January 2017. However, ESI Funds mainstream programmes, in the current 2014-2020 period, continue to operate mainly according to national logics. Good results in term of macro-regional projects can be reported only in the case of some Interreg programmes (e.g. CBC Italy-Croatia, IPA-CBC Italy-Croatia-Montenegro). Dialogue meetings between EUSAIR key implementers and national authorities responsible for IPA funds in the four Enlargement countries should also take place at the earliest convenience. -With regard to the migration and refugee issue, ensure the necessary follow up to the recommendation delivered by ministers in the Ioannina Declaration (2017) to set up a collaborative platform to better coordinate countries’ response to the migration crisis, and to consider an expansion of the EUSAIR Action Plan with a view to including integration of migrants in the labour market. The European Council of 19-20 December 2013 invited the Commission, in cooperation with Member States, to elaborate an EU Strategy for the Alpine Region by June 2015 72 , recalling its conclusions of June 2011 and the Council Conclusions on the added value of macro-regional strategies of October 2013. Building on the lessons learnt and experience from the other previous three macro-regional strategies, the Commission prepared a Communication and an Action Plan on the EU Strategy for the Alpine Region (EUSALP), which was adopted by the Commission in July 2015. On 27 November 2015 the Strategy was endorsed by the Council 73 and on 28 June 2016 by the European Council. of which 48 Regions are involved in the process 74 , and is home for more than 80 million people. After only two years of implementation, the work of the EUSALP Action Groups (AGs) has entered in a phase of continuity and routine. Notwithstanding some technical issues common to all strategies, a step forward in the field of multilevel governance could be achieved in different terms. EUSALP Presidencies (Bavaria in 2017 and Tyrol in 2018) have played an active role in setting policy orientations for their presidency. Bavaria in 2017, under the motto "EU Alpine Strategy- joint action for the benefit of the Region", determined and prioritised thematic focuses of all actions together with the Alpine Region partners. The EUSALP General Assembly agreed, in Rottach-Egern in February 2017, on a series of focus topics such as the Master Plan bioeconomy in the Alpine Region, supporting public services with a three-dimension landscape model of the entire Region, addressing the needs and ideas of the young generation for a good future of Alpine farming, or the energetic optimisation of buildings. The Tyrol Presidency adopted a work programme in 2018 aiming at "shaping future together- in the interest of the Alps!". They focussed efforts on dual education, on sustainable modes of transport by, for instance, combining passenger information systems for public transport in the form of a EUSALP-wide travel information platform, or on further development of integrated natural hazard management to establish risk governance in the Alpine Region. Several projects have already been selected, mainly under the Interreg Alpine Space transnational programme, which funding is essential, but by far not sufficient for the success of the Strategy if other programmes do not provide a proportionate support to its objectives. Almost 80 ESI Funds programmes concern the territory of the Alpine macro-region and could therefore be mobilised to support priorities and projects of the Strategy. “AlpLinkBioEco 75 ” works to develop a circular bio-based economic strategy including a roadmap and advice to assess, select and create innovative value chains for the Alpine Space wood, agriculture, food/pharma and chemistry sectors. Through a smart village approach, “SmartVillages 76 ” brings together policy makers, businesses, academia and civil society and fosters innovation through ICT based participatory tools to keep villages attractive to work and live in. “CirculAlps 77 ” aims at developing innovation to foster sustainability and circular economy in Alpine forestry value chain. In 2017, together with the Bavarian partners, the “Mount Erasmus 78 ” network was launched, that promotes common activities of agricultural schools in the Alpine region. In 2018 the topic of youngsters and of dual education is exploited with the Tyrolean Presidency. In 2017 too, the ‘First Forum on Dual Education 79 ’ in the Alpine Space took place and it created a good basis for an active collaboration of stakeholders. The 2nd such Forum took place in November 2018 80 . “PlurAlps 81 ” offers transnational solutions for the integration of migrants in Alpine municipalities. It includes pilot projects and a social planning tool to assess the demographics and needs of migrants and enhance the performance of municipalities. “HEALPS 82 ” concerns Alpine Health Tourism and aims at positioning the Alpine region as globally attractive health promoting place. “Greencycle 83 ” promotes cooperation, mutual learning, shared capacity-building and exchange of experiences among Alpine public administrations to foster the implementation of the concept of circular economy and achieve a reduction in carbon emissions. “SMART ALTITUDE 84 ” helps overcome differences in territorial governance and infrastructure management among winter tourism destinations. The goal is to develop a shared, transnational approach to clean energy policy implementation in mountain areas. “GRETA 85 ” develops a shared knowledge base for the transfer and adoption of near surface geothermal energy systems in the Alpine area. It will deliver tools to support decision making and encourage appropriate policymaking. “RockTheAlps 86 ” focuses on forests as a protection element against rock fall and fosters their use in risk management and prevention policies. The project will provide the first Alps-wide harmonised rock fall risk and protection forests map. “GreenRisk4ALPs 87 ”: although their effectiveness is recognised, forests and ecosystem services have been seldom integrated in risk mitigation strategies. GreenRisk4ALPs (GR4A) develops ecosystem-based concepts to support risk governance. “HyMoCARES 88 ” fosters the conservation of Alpine rivers and related ecosystems by providing innovative basin planning and management tools based on the ecosystem services approach, while ensuring integration of local and basin levels. “GaYA 89 ” fosters the involvement of young people in regional governance and develops new approaches for decision-makers. Building on local experiences, the project will produce a participation toolkit and policy recommendations. “AlpGov 90 ”: its main objective is to support effective and efficient EUSALP implementation in a systematic transnational approach. It is meant to design and test appropriate governance structures and mechanisms, mainly at the level of Action Groups (AGs), and to create synergies with the other EUSALP implementing bodies: General Assembly and Executive Board and other institutional actors. As described in the COWI 91 study, the building of the governance process in MRS goes through three steps of development. As EUSALP was adopted only three years ago, the first two phases are still undergoing consolidation. EUSALP official launch took place in Brdo in January 2016 and its implementation started immediately after, thanks to the high level of political and economic cooperation already existing in the Region. During the first year of implementation, the governance structures and the rules of procedure of the implementing bodies were agreed. All the Coordinators of the 9 AGs were appointed and first meetings resulted in an agreement on further working methods and the setting up of a work programme identifying thematic topics to be followed by each AG, in line with EUSALP Action Plan. A Board of Action Groups Leaders was also established to ensure the permanent exchange of knowledge and experiences among the nine AGs. This very quick start of the implementation has raised many expectations among stakeholders. Immediately after the adoption of the work programme of each Action Group, practical work has started. All AGs meet regularly (several times a year), as well as the Executive Board under the rotating presidency put in place (Bavaria in 2017 and Tyrol in 2018). However it is important to stress that outputs, results and impacts have a time dimension, as highlighted in "COWI study". According to participation of states and regions in the Action Groups, progress has been made and, as a general trend, the number of participating representatives and stakeholders was increasing in this reporting period (all AGs achieved the necessary quorum), demonstrating that EUSALP gains more and more attraction. Nevertheless, it remains a challenge to mobilise AG members with the necessary decision making capacity and technical competence and there is still potential to better involve, in particular, representatives from the national level and from some countries/regions and territories. AGs would welcome if the Executive Board (EB) would continue encouraging states and regions to ensure an appropriate representation in AGs and to encourage relevant stakeholders to also do so. Despite some delays - which can be mainly explained by the recent set up of the project – the governance project AlpGov under the Interreg Alpine Space programme is on track. Deliverables are already made available, or are in preparation according to the project plan. However, AlpGov project partners see the need for amendments and decided to address a request for change to the Alpine Space programme. It is planned to add a new communication activity aiming at more practical communication work so as to enhance visibility of the EUSALP, and to extend the project duration until end of 2019 so as to create synergies with the EUSALP presidency terms. Nevertheless, the AlpGov project should not exhaust its full budget. As an estimation, the total budget consumption should remain in a range between EUR 3 and 3.5 million. AGs are fully aware that they have to draw more attention to political aspects, e. g. by means of political conferences and joint declarations helping to change political mind-set. First initiatives in that respect were started (Green Infrastructure Conference, Forest summit Protection-Forest-Climate, Mobility Conference) and are expected to be continued or even intensified in the future (e.g. on smart villages, energy, etc.). AG leaders acknowledge that this is indispensable for getting higher political ownership, thus leading to better participation in the AGs. The cooperation with the Alpine Convention should improve, thanks to a joint workshop in October 2017 where joint fields of activities were identified. Further exchanges between the two bodies format should be continued on a regular basis. Furthermore, some of the AGs agreed on better share of responsibilities. The governance structures within the AGs are better settled now, even though the composition varies, e.g. in terms of numbers of group members, setting up of sub groups, participation of stakeholders. AG leaders have got a clearer picture on their role and what is expected from them from outside partners. The 1st EUSALP annual forum took place in Munich on the 23th and 24th November 2017. A Citizen's dialogue also took place in parallel. The 2nd annual forum took place on the 20th and 21st of November 2018 in Innsbruck, Tyrol, with the political will of involving more directly and more concretely youth into the implementation of the Strategy. The first EUSALP Conference of Environmental Ministers held on 2 October 2017 in Munich gave an example of the added value of macro-regional approach. The political landmarks were set to make the Alpine region a model for implementing the EU Green Infrastructure (GI) Strategy. 27 Alpine states and regions adopted the political declaration “Alpine Green Infrastructure – Joining forces for nature, people and the economy 92 ” in the presence of representatives from the European Commission, the European Parliament and the Alpine Convention. In cooperation with the “LOS_DAMA! 93 ” project, funded by the Interreg Alpine Space programme, at the margins of the conference, Mayors of Alpine cities (Munich, Vienna, Torino, Trento, and Grenoble) initiated a network on deploying Green Infrastructure in Alpine urban areas by signing a Memorandum of Understanding. This network gives a first concrete example for implementation activities on municipality level and a strong signal of the inclusive political framework that the EUSALP could provide when explicitly involving Alpine cities into the scope of activities. To enhance shared Alpine governance, the AG4 carried out a study to explore existing governance mechanisms and strategic potentials in the field of mobility within the Alpine Region. The study, developed by the University of Innsbruck – ICER (Innsbruck Center of European Research) was finalized and published in December 2017. This kind of initiative could be usefully extended to all AGs. The Strategy has not reached this phase yet, even though several projects have already been selected. They are still at an early stage of implementation and have not delivered results yet (examples of those projects are presented in the previous section). As mentioned above, the establishment of a Board of Action Groups Leaders ensuring the permanent exchange of knowledge and experiences among the nine AGs, has greatly facilitated a common approach and a better coordination. Concerning cross sectoral cooperation and with a view to setting up more implementation activities, the Alpine Region Preparatory Action Fund 94 (ARPAF) proved to be extremely helpful. For some AGs it served as a boost for developing implementation activity, establish horizontal cooperation and making EUSALP work more visible. The AlpGov project supported by the Interreg Alpine Space programme also helps in this respect by coordinating activities of different AGs. By way of example, the work of AG 7 is closely connected to other EUSALP Action Groups. Besides a joint workshop with AG 8 during the 1st EUSALP annual forum (November 2017), (on the role of forests in natural hazards management and Green Infrastructure in the context of Community Led Local Development), the ARPAF project “TRANSALP 95 ” is jointly implemented with AGs 2 and 3. The TRANSALP project addresses the strategic potential of medical and aromatic plants and therefore exemplarily stands for the potential of bio-based products for maintaining Green Infrastructure (GI) elements and fostering green economy business models / value chains for GI. In AG3, the hope is to arrive soon at a point of common understanding where the education can be connected to the work of every action group and cross-sectorial projects can be established. The Alpine Space programme has invited the EUSALP Action Group leaders (AGL) to elaborate a specific action aiming to help the coordination of their work, to be funded by the AlpGov project. AG 7 on ecological connectivity has developed close cooperation with the EUSAIR (e.g. Mediterranean Coast and EU MRS Week 2016 and 2017) and has initiated cooperation with the EUSDR. A joint workshop of all 4 MRS is under preparation with the support of the Interact aiming at exploring synergies and strengthening coherence on themes of Green Infrastructure and related governance and financing mechanisms at EU level. Finally, the issue of Green Infrastructure will be brought to the attention of the next ENCORE-Conference of regional Environmental ministers of Europe. Alpine Space programme remains by far the main contributor to the Strategy. EUR 94,340, 000 have been allocated, after three calls, to 49 projects contributing to the objectives of the Strategy. Very few other programmes have so far considered the EUSALP priorities in the selection of their projects. As part of the AlpGov project, one activity concerns the set up of a common target system as basis for further activities. In 2017, a draft proposal for a target system based on the objectives of (1) reduction of environmental impacts of transport and (2) secure accessibility and connectivity of sustainable transport systems, was presented and discussed with AGs.. The development of a EUSALP wide target system stands in close relation with the identification of relevant criteria for the systematic assessment of individual projects and should be finalized together with the project assessment methodology by mid-2019. A study launched by the Commission and carried out by Politecnico di Milano 96 also offers different contextualised pieces of information which can help AGLs and the Executive Board members to orient their decisions and guide their actions. AG 1 has two missions related to communication. The first, as part of AlpGov project, is to build a communication strategy and the tools supporting it. So far, AG 1 has developed the EUSALP website 97 , but the communication strategy as such still needs to be agreed. Another mission of AG1 is to facilitate knowledge. In this respect, the “Platform of Knowledge (POK)” is meant to enable the creation of new networks and processes through the many tools it makes available, such as the eLearning area, designed to improve the development of the capacity building of research institutes, networks and infrastructures in the Alpine Region. The virtual meeting room, in turn, will allow EUSALP members to participate in meetings and online inter-groups, thus optimising time and money. Furthermore, thanks to the Antenna Network, EUSALP members can disseminate learning content (training courses, workshops, seminars) throughout the EUSALP area and beyond, in order to reach an audience as large as possible. The PoK provides users with visualization tools, such as EUSALP 3D and 2D maps, the Data Explorer and Graphic Generator, and Urban Sensing Reports. These tools allow different types of users to explore content related to different EUSALP sectors as, in the case of AG1, strategic R&I sectors, universities, research centres, clusters, etc. The possibility to view open data already available at EU, national and regional level facilitates and promotes collaboration with different actors. Even though the EUSALP is gaining more and more traction - and all AGs achieve the necessary quorum in their meetings - it remains a challenge to mobilise AG members and provide them with the necessary decision making capacity and technical competence. Representatives from the national level and from some countries/regions and territories should be better involved. AGs call for continuous action of states and regions to ensure an appropriate representation in their works. It is also very important that the Board of Directors regularly takes stock of the achievements of the Strategy, examines the work of the Action Groups, assesses whether the actions and projects shall contribute to the included in the Strategy and, finally, gives Actions Groups the orientations they are expecting to continue implementing their tasks. In particular, when an Action Group reports a specific issue to the Executive Board, the latter should examine it and find an appropriate reply to it. "EUSALP presents an actual economic strength and a potential for future growth and modernization comparable with the Northern area of the large capitals of Europe (London, Paris, Brussels, Berlin). This potential, if supported by a strong political will, could allow the macro-region to upgrade its decision-making power inside the Union, counterbalancing the power of the Northern area. Beyond political will, which is in the hands of policy-makers, a crucial precondition for achieving this result lies in the psychological attitudes of people and communities of the macro-region. Enhancing trust with neighbouring regions and countries and reinforcing an Alpine identity building process should become a priority in the political agenda in the near future." Not surprisingly, like in any MRS, a better embedding of the EUSALP into other funding programmes remains a challenge. Only few managing authorities of ESI Funds programmes seem to be aware of the possibilities of mutual support that programmes and EUSALP can offer to each other, even though several workshops and meetings have already been organised under Bavarian and Tyrolian Presidencies to raise partners' awareness on this critical issue. Further substantial efforts must be undertaken to improve the situation in a near future, and in particular in the preparation phase of the next programming period. Communication remains an issue. Even though communication tools were elaborated, there is a need for improvement in terms of technical setting and even more in content related communication work. AG leaders are well aware that much more communication work on EUSALP results is required. Particularly, success stories of the Action Groups work shall be communicated and ultimate communication work generally needs to be professionalised. Summarising all aspects mentioned above, after a phase of investing in structures and identification of priorities, the AGs entered in a phase of “harvesting” concrete results in the year 2017, which was deepened in 2018. Up to now, the Action Plan is still a good basis for practical work and there is no need for revising it, although in some AGs tendencies to go beyond the Action Plan can be observed. Instead, a change of mind-set in terms of implementation, communication, transfer of results and skills development within the AGs on the basis of the existing Action Plan is useful and should be further developed. “In most cases, policies to increase competitiveness should not focus on new investments in key resources, but rather on a better governance of the resources that are already present, in the spirit of cooperation and synergic attitude behind the creation of EUSALP. The explanation of the different capacity of exploiting abundant resources are searched for each pattern in the presence of complementary resources, with the idea that competitiveness lies on the interaction and synergic mechanisms of tangible and intangible resources, according to a ‘balanced development’ perspective. For the industrial development patterns, soft social elements, like trust and cooperative attitude, are crucial for SMEs, while in the case of large firms, both high‐tech and traditional, the presence of a strong capacity to turn knowledge into the commercialisation of products prevail in sustaining local competitiveness. For the touristic and agricultural areas, the capacity to exploit the key resources is strongly dependent on the simultaneous presence of identity feelings, of branding of local products and activities, capacity to preserve landscape and quality of natural resources, all accompanied by a qualified human capital". 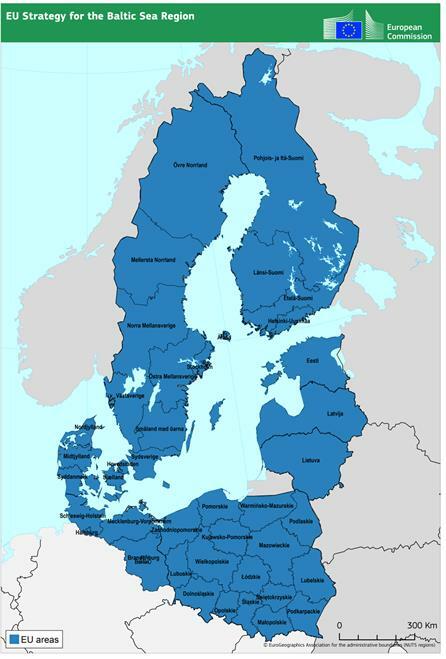 95 mainstream, Interreg and ENI-CBC programmes are relevant for the EU Strategy for the Baltic Sea Region (EUSBSR). 34 ESI Funds operational programmes reported to have already invested funds, which contribute to the implementation of the EUSBSR. It is worth to note that the above table reports only on reliable data. In fact, in some cases mainstream programme managing authorities considered that the full amount of the programme contributes to the objectives of the Strategy. Such cases have not been taken into account. Compatibility of programmes to the EUSBSR priorities is a very important factor that may indicate where there is still scope for cooperation and where programmes may, in the future, contribute to the EUSBSR. 39 programmes have provided information on compatibility with and contribution to specific thematic areas of the EUSBSR. The most supported areas are: PA ‘Innovation’ (31), PA ‘Transport’ (27), PA ‘Culture’ (27), PA ‘Education’ (25), HA ‘Climate’ (23) and PA ‘Energy’ (22). 95 programmes (ESI Funds mainstream, Interreg and IPA CBC programmes, and IPA II mainstream) are relevant for the EU Strategy for the Danube Region (EUSDR). Furthermore, the Monitoring Committees of 3 programmes (Human Resources Development in Bulgaria -ESF, Research and Innovation in Slovakia-ERDF and Interreg V-A – Romania-Hungary) decided to directly invest funds on EUSDR objectives planning to open targeted calls for proposals. 14 ESI Funds operational programmes reported to have already invested funds, which contribute to the implementation of the EUSDR. Reported contribution form EAFRD and EMFF were both 0. It is worth to note that the above table reports only on reliable data. In fact, in some cases mainstream programme managing authorities considered that the full amount of the programme contributes to the objectives of the Strategy on the basis that policy areas match with the EUSDR Pillars. Such cases have not been taken into account. In some other circumstances managing authorities reported on projects in line with the EUSDR objectives but no funds invested, which leads to underestimation of funds invested in the Strategy. There is probably, among some OPs, still a lack of understanding on what determines a project with macro-regional added value. Even though the number of programmes that have already invested directly in the EUSDR is relatively small (14), it is worth noting that 22 programmes (13 ESI Funds and 9 Interreg programmes) are planning or open to invest funds in the EUSDR. 99 ESI Funds programmes and 12 IPA II programmes are relevant for the EU Strategy for the Adriatic and Ionian Region (EUSAIR). Among them, three Interreg programmes - two transnational (Mediterranean; Balkan-Mediterranean) and one CBC (Italy-Austria) - marginally covering the EUSAIR region could be considered relevant and contribute to it. All this considered, 111 programmes are relevant for the analysis. ü2 IPA II Multi-country programmes. Furthermore, the Monitoring Committees of two programmes (Interreg V-B - Adriatic-Ionian and Interreg V-A - Italy-Croatia) decided to directly invest funds on EUSAIR objectives planning to open targeted calls for proposals. 4 ESI Funds operational programmes reported to have already invested funds, which contribute to the implementation of the EUSAIR. It is worth to note that the above table reports only on reliable data. In fact, in some cases mainstream programme managing authorities considered that the full amount of the programme contributes to the objectives of the Strategy on the basis that policy areas match with the EUSAIR Pillars. Such cases have not been taken into account. In some other circumstances managing authorities reported on projects in line with the EUSAIR objectives but no fund invested, which leads to underestimation of funds invested in the Strategy. There is probably, among some OPs, still a lack of understanding on what determines a project with macro-regional added value. Even though the number of programmes that have already invested directly in the EUSAIR is rather small (only 4), it is worth noting that a relatively big number of programmes (8 ESI Funds Regional and one national programmes, 1 Interreg Transnational and 3 Interreg cross-border programmes) is planning to invest funds in the EUSAIR and that 4 programmes are considering the possibility to do so in the future. This is certainly a positive development for the future of the Strategy with the potential to effectively boost its implementation. Also EUSAIR cross-cutting issues have been often mentioned as compatible with the programmes, the most supported being in the following order “Strengthening R&D, innovation”, “SMEs development”, “Capacity building”. Following a very strict geographical approach (which means to include all programmes that touch the EU Strategy for the Alpine Region (EUSALP) perimeter) 89 programmes can be identified that are relevant for the EUSALP. This concerns country-specific as well as Interreg programmes. However, from a functional point of view only 78 programmes are de facto relevant for the EUSALP. This means to exclude programmes like e.g. the transnational ADRION programme that primarily focuses on the EUSAIR or cross-border cooperation programmes like Interreg V-A - Slovenia-Hungary. 5 out of these 78 programmes provided replies to the checklist. More detailed (aggregated) information is provided in the table below. 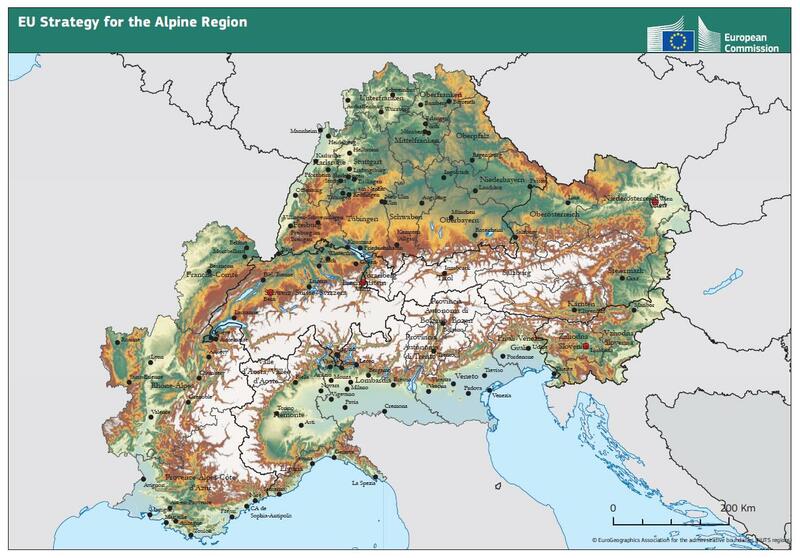 üThe transnational Interreg Alpine Space Programme is strongly moving in the direction of the EUSALP. The programme has invited the EUSALP Action Group leaders (AGL) to elaborate a specific project which helps to ease and coordinate their work and is funded by the programme: AlpGov project, which gets 3.2 million euro from ERDF. The AlpGovs’ main objective is to support effective and efficient EUSALP implementation in a systematic transnational approach through designing and testing appropriate governance structures and mechanisms mainly on the level of Action Groups (AGs), at the same time to create synergies with the other EUSALP implementing bodies General Assembly and Executive Board and further institutional actors in alpine policy. üMoreover, the programme establishes links between projects and EUSALP AGL (e.g. via asking lead partners of approved projects to get in touch with AGL, Informing about AGL and EUSALP contribution of approved projects in regular newsletters, nominating representatives of Joint Secretariat for each EUSALP action group, asking project applicants to consider if and how the project could contribute to EUSALP and nominating representatives of managing authorities for EUSALP Executive Board. The Alpine Space programme does not foresee that EUSALP national coordinators or other EUSALP bodies send representative to the programme committee, but in some countries the same persons act as EUSALP national coordinator and Interreg Alpine Space Programme committee member and thus another link is established). üOnly two programmes (the Interreg Alpine Space TN Programme and the Slovenia 2014-2020 Operational Programme) include key implementers of the Strategy in their Monitoring Committee. üOnly one programme (Italy-Austria CBC) has attributed extra points to specific measures supporting the EUSALP. üThe four programmes which have replied reported that they have mobilised 381,400,246 € of ERDF and 822,164,484 € of cohesion fond (from Slovenian programme) for macro-regional projects, that is 1,203,564,730 € altogether. üIn addition to this amount, 94,340,000 € must be added from Alpine Space programme which has selected, after three calls, 49 projects contributing to the objectives of the Strategy. Regulation (EU) No 1303/2013 of the European Parliament and of the Council of 17 December 2013 laying down common provisions on (the European Structural and Investment Funds) (OJ L 347, 20.12.2013, p. 320); point 31of Article 2. European Council Conclusions of 14 December 2007, point 59: ‘Without prejudice to the integrated maritime policy, the European Council invites the Commission to present an EU strategy for the Baltic Sea region at the latest by June 2009. This strategy should inter alia help to address the urgent environmental challenges related to the Baltic Sea. The Northern Dimension framework provides the basis for the external aspects of cooperation in the Baltic Sea region’. Communication from the Commission concerning the European Union Strategy for the Baltic Sea Region - 10.6.2009 - COM(2009) 248 final. Conclusions of the General Affairs and External Relations Council, 27 October 2009 and Conclusions of the European Council, 29-30 October 2009. Norway has recently shown interest in being more involved in EUSBSR and have attended NC-meetings as an observer. Commission report on the Implementation of the EU Strategy for the Baltic Sea Region - 22.6.2011 - COM(2011) 381 final. Commission report on the implementation of EU macro-regional strategies. 16.12.2016 - COM(2016) 805 final. Matti Maasikas, Undersecretary for European Affairs, Ministry of Foreign Affairs of Estonia, in his closing speech at the annual forum in Tallinn (4-5 June 2018) suggested having regular meetings of ministers responsible for regional development of eight countries organised back-to-back to the annual forum. In case of Germany four landers (Berlin; Brandenburg; Hamburg; Mecklenburg-Vorpommern; and Schleswig-Holstein) are part of the EUSBSR. European Council Conclusions of 19 June 2009, point 34: ‘It (…) invites the Commission to present an EU strategy for the Danube region before the end of 2010’. Communication from the Commission concerning the European Union Strategy for the Danube Region - 8.12.2010 - COM(2010) 715. Conclusions of the General Affairs Council, 13 April 2011 and Conclusions of the European Council, 23-24 June 2011. Report from the Commission concerning the European Union Strategy for the Danube Region – 08.04.2013 -COM(2013) 181 final. Conclusion of General Affairs Council, 29 September 2014 and Conclusions of the European Council, 23-24 October 2014. Communication from the Commission concerning the European Union Strategy for the Adriatic and Ionian Region – 17.06.2014 – COM (2014) 357 final. Communication from the Commission adopting a Maritime Strategy for the Adriatic and Ionian Seas – 30.11.2012 – COM(2012) 713 final. According to the COWI report, MRS undergo three phases of development/maturation: I capacity of the internal actors mainly at individual level; II development of the institutional capacity and performance of internal MRS actors managing the Strategy and capacity of external stakeholders to respond to the strategy: III external stakeholders and the region as a whole are performing. EUSAIR Synthesis Report (draft): Multi-Governance and Cross-Border Practices Supporting the European Union Macro-Regional Strategy for the Adriatic and Ionian Region, OECD, July 2018. The AII Permanent Secretariat is a standing member of the GB and the Ministerial meeting, tacking place at the margin of the annual forum and closing the yearly chairmanship, is a joint EUSAIR-AII meeting. EUSALP (Italy and Slovenia), EUSDR (Bosnia and Herzegovina, Croatia, Montenegro, Serbia and Slovenia). Council Conclusions on the EU Strategy for the Alpine Region, 27 November 2015 and the European Council, 28 June 2016. Austria (Burgenland, Kärnten, Niederösterreich, Oberösterreich, Salzburg, Steiermark, Tirol, Vorarlberg, Wien), France (Auvergne-Rhône-Alpes, Bourgogne-Franche-Comté, Provence-Alpes-Côte d’Azur), Germany (Baden-Württemberg, Bayern), Italy (Friuli Venezia Giulia, Liguria, Lombardia, Piemonte, Provincia Autonoma di Bolzano, Provincia Autonoma di Trento, Valle d'Aosta, Veneto), Switzerland (Aargau, Appenzell Ausserrhoden, Appenzell Innerrhoden, Basel-Landschaft, Basel-Stadt, Bern, Freiburg, Genf, Glarus, Graubünden, Jura, Luzern, Neuenburg, Nidwalden, Obwalden, Schaffhausen, Schwyz, Solothurn, St. Gallen, Tessin, Thurgau, Uri, Waadt, Wallis, Zug, Zürich). Due to non-availability of more updated data, in the case of IPA II and IPA CBC programmes data from 2016 reporting have been used. Due to non-availability of more updated data, in the case of IPA II programmes data from 2016 reporting have been used.